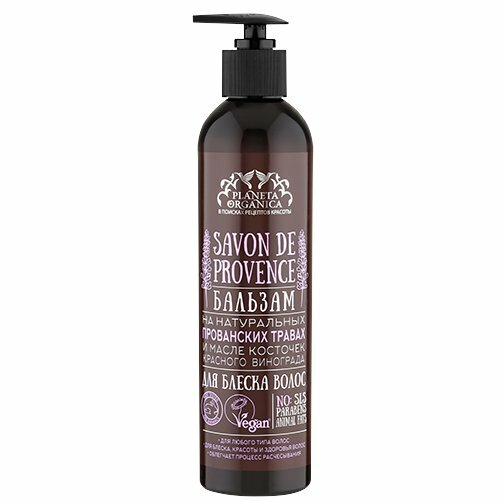 Savon de Provence Hair Conditioner is produced by the Russian beauty brand Planeta Organica for its Savon de Planeta Organica line. It is designed to restore the natural shine of the hair. The product is suitable for all hair types, it keeps the hair looking shiny and healthy, as well as makes combing and styling easier. Formulated with herbs de Provence and grape seed oil. The conditioner contains natural extracts and oils derived from Provence herbs such as lavender, oregano, sage, peppermint and rosemary. Lavender oil and rosemary oil have a nourishing and rejuvenating effect. They help to make the hair smoother and shinier. Peppermint extract has a refreshing and toning effect on the scalp. A blend of organic vegetable oils (grape seed oil, olive oil, apricot kernel oil, avocado oil) moisturises and nourishes your hair and scalp, prevents dehydration and flaking, strengthens hair roots. The product is free of SLS, parabens, animal products, artificial colourants and fragrances. Certified by ECOCERT and the Vegan Society (the Vegan Trademark standards). Directions. Apply onto wet hair, spread evenly. Rinse thoroughly with warm water. Ingredients. Aqua, Cetearyl Alcohol, Vitis Vinifera Seed Oil, Cetrimonium Chloride, Olea Europaea Fruit Oil, Behentrimonium Chloride, Salvia Officinalis Leaf Water, Rosmarinus Officinalis Leaf Oil, Origanum Vulgare Leaf Extract, Mentha Piperita Leaf Water, Prunus Armeniaca Kernel Oil, Persea Gratissima Oil, Panthenol (provitamin В5), Lavandula Hybrida Oil, Lauryl Glucoside, Citric Acid, Benzyl Alcohol, Benzoic Acid, Sorbic Acid, Parfum, Linalool, Limonene. Want to buy Savon de Provence Hair Conditioner? Call us or submit your order via our web site! Planeta Organica presents its new line Savon de Planeta Organica. It comprises personal care products based on certified natural soap made according to traditional recipes from around the world. They include liquid soaps, shampoos, hair conditioners, shower gels, and a foaming facial cleanser. Planeta Organica is a subsidiary of Pervoe Reshenie (First Solution), a well-known Russian cosmetic manufacturer that produces natural and organic cosmetics formulated with high-quality vegetable oils, essential oils and herbal extracts. It produces a wide range of personal care products, from shampoos and hair conditioners to oil blends and body butters, based on traditional beauty recipes from all inhabited continents. Savon de Planeta Organica is one of the company’s newest lines, it was launched in September 2016. Its main feature is the use of certified natural soaps made according to old French, Spanish, Syrian, Egyptian, African, and Siberian recipes. Marseille soap, Castile soap, Aleppo soap, African black soap and other soaps used by Planeta Organica are based exclusively on vegetable oils such as olive oil, coconut oil and shea butter. They produce a light, airy lather that doesn’t dry the skin out. All Savon de Planeta Organica products are free of SLS (sodium lauryl sulfate) and other aggressive surfactants, parabens, animal fat, synthetic colourants, mineral oils, and GMO. Their safety and natural composition are confirmed by international certificates issued by ECOCERT and the Vegan Society. The only non-vegan products in the line are Savon de Cleopatra because they contain honey and milk protein.